Mischa Barton and Rumer Willis have been cast opposite Bruce Willis, Rumer's father, in the dark comedy "The Sophomore" for Yari Film Group. In this teenage take on "Chinatown," Barton plays the most popular girl in her Catholic high school. She persuades a sophomore reporter to investigate the theft of SAT exams, but after he reveals that the school's president and top jock are responsible, a more sinister conspiracy emerges. 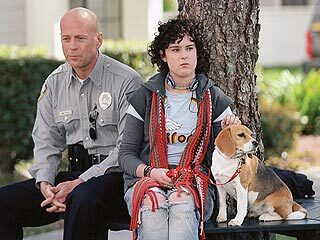 Rumer Willis plays the troublemaking sidekick of Barton's character. Bruce Willis plays the school's twisted principal, a Desert Storm veteran who can't let go of his glory days in Kuwait. 'Ol waterhead is churning out quite the career. First 'Striptease' and now this. Unstoppable! Well Rear Window. Classic suspense film. Remade as Disturbia. Did very well. So teenage remakes of classic movies are going to be "in." Did Faye Dunaway even have a sidekick? "She's my sister. She's my daughter, I had her when I was two!" But it was Nicholson who had the warped past. Yet the jock is going to be investigating? There seems to be a lot of difference between this and Chinatown. If you want to see teen-noir, see Brick. Great film. Simby you should have included pics. I had to look up Rumer Willis. I'd never seen her before. SHE LITERALLY LOOKS LIKE ONE OF THOSE MORPHED PICS OF CELEBS FROM CONAN. Am I the only one who didnt like the original?